Santorini or Thira or Strongyli is located in the Southern Aegean Sea on the island complex of Cyclades. From the 1980s until today the island have chosen to marry, or to spend their honeymoon, thousands of couples from all over the globe. It is estimated that every year more than 500 rites. Orthodox weddings usually take place at churches overlooking the caldera as the Diocese of Fira, Agios Minas, the Church of the resurrection in imerovigli, Saint George and Mary Platsani of OIA. Catholics are choosing the Cathedral of Fira. The small port of Fira is located at 900 feet below the village of Fira. Large cruise ships arrive at the port of Fira at regular intervals, generating substantial income on the island. Donkeys and mules are the classic means of transport for the fantastic this path to the stairs that lead to the old port. Is available at the top and bottom of this steep trail. 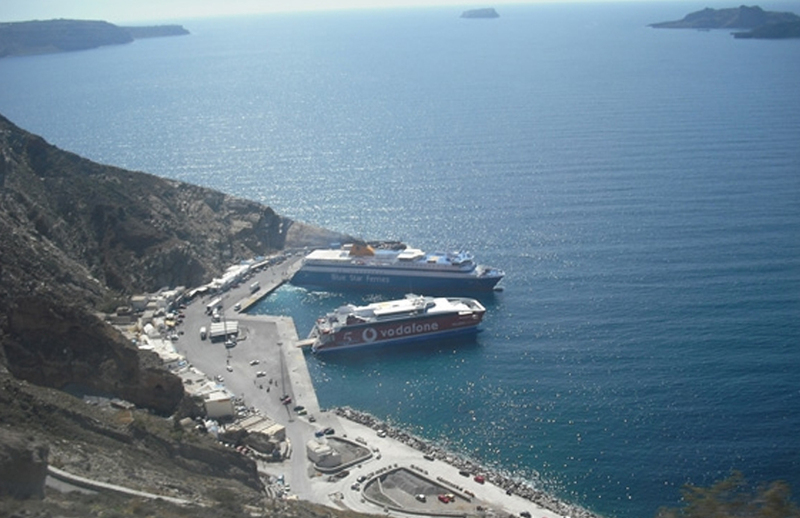 The meeting point is the main port of the island is associated with Fira but with all villages of Santorini with buses regularly synchronize their schedules with the arrival and departure of ships. Guests are served and with the island's taxi (Tel. + 30 22860-22555). daily departures all year for the port of Piraeus. At the same time connected with daily itineraries with all the Cyclades, Crete and the Dodecanese. For information on arrivals and departures you can contact the Santorini port authority: 22860-22239 phone. The ferry companies approaching the port of Santorini and have started from the port of Piraeus is the Blue Star Ferries, Hellenic Seaways and Aegean Speed Lines. Air Champion24 .com offers ferries to and from Santorini on all services performed from any port of Greece. You can easily search and choose your ferry route that it serves, easily and instantly. The booking takes place in real time using your credit card or by making a booking with the help of the staff of our Office.